Up until now, the only mixers to gain Traktor Scratch certification have been Firewire equipped models, as generally this has been the interface of choice for mixers with built-in sound cards. But it seems that Allen&Heath's USB2 sound card laden xone:4D behemoth may well be heading down that route as well. From time to time, disturbing imagery comes my way. "Such is the way of the internets Giz" you may shout, but not when used to promote products. Le Jad's vinyl covers depicting damaged dolls always disturbs the hell out of my daughter, but this image from EKS's OTUS web site material is just a total mindfuck. I love it. You may recall that when I reviewed the Ecler NUO2.0, I was quite let down that despite it's Vestax PMC06 size and rugged style, the crossfader curve wasn't up to the task of fast finger style cuts. Well Ecler listened and made a fix for existing users available as well as making sure that all factory fresh models were up to the task. And that fix is for all NUOX.0 models as well, as witnessed by this hastily thrown together clip filmed between hot sweats, splitting headaches and coughing fits. UPDATE:Clarification on serial numbers and how it works has been recieved. 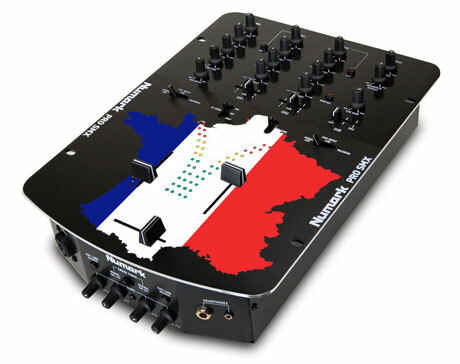 I read on a couple of sites about Numark's �ber scratch mixer the Pro SMX hitting the streets. Obviously not receiving any PR at all made me stomp around the skratchlab and fire off emails to high ups at Numark Towers. And I've come away with a feeling of total confusion. Allow me to explain. A short story from the very earliest history of this little site. Waaay back in the day when skratchworx was but a simple organism, trying to drag itself from the primordial slime up onto dry land, I fired off several speculative love e-letters to assorted industry types, with zero expectation of getting anything back. But something did come back - a full copy of Final Scratch 1.1 and entry into the beta testing program from Laurent Cohen - at the time sitting pretty at the top of the Stanton food chain. So when 5 years later I get another mail from Laurent telling me of his new venture, I'm more than happy to spread the word. 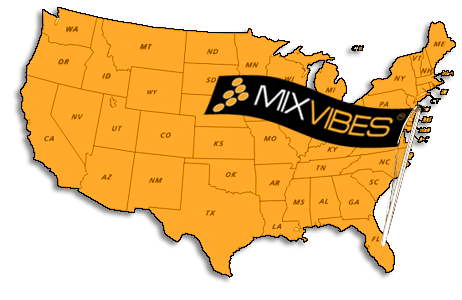 Mixware LLC is a new distribution company that has been appointed as sole distributor for MixVibes in the US. Like any good hack, part of what I do is to dig deep and find out just what the hell is and will be going on in the DJ scene. But sometimes, digging is completely unnecessary as I literally fall over hot news laying in my digital path. One such hot potato of info is in plain view on Native Instruments' jobs page. Looks like Traktor could be experimenting with video. Portable PAs are getting smaller and smaller, but this is about as small as it's ever likely to get. Granted, it'll be a very select party but the Dreams turntable-like speakers apparently kick out quite a racket, especially when you engage the wikiwikitastic scratch mode. I've never needed a facepalm emoticon more than I do right now. Being an uncle is a lot of fun. I get to share my DJ toys with Dylan, and sometimes he even lets me play with the new shiny stuff that his gadget freak dad brings across. But imagine my surprise when he brought across a near exact copy of EKS's very imminent OTUS controller. Dylan loves it and just likes to point at himself in the mirror and say "dede". 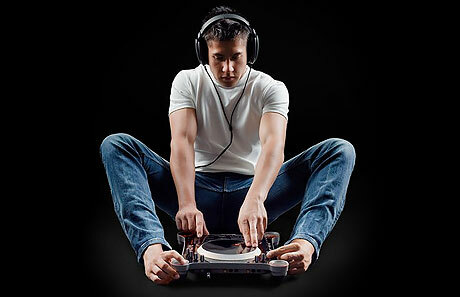 He did comment that the lack of MIDI is an issue, as is the oh so static bright blue platter is tough to scratch on. 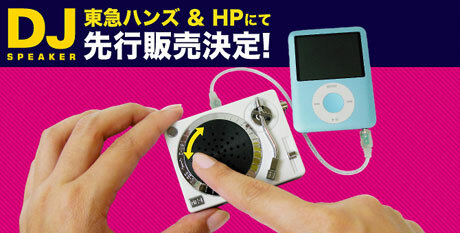 Controllers are designed to manipulate the music on your hard disk. But seeing as the hard disk is just a spinning platter... just like on a controller... you can see where this is heading right? Well not quite - it would be crazy to think that some wacky boffins had cracked open a drive and scratched with directly, but it's a nice left of centre take on the whole controller thing. Using the platter and ultra smooth bearing based mechanism of a regular hard disk, the guys over at Indestructables have come up with undoubtedly the smoothest jog wheel in controllerdom today. POLL: What's your DJing OS? Now I'm rocking a shiny new MacBook Pro, I'm enjoying the best of both previously disparate worlds - yes, I have OS X and Vista sharing screen real estate and happily running side by side thanks to the joys of VMWare (although I see that Parallels 4 is out today). Anyway, a question I've often pondered is market share in the DJ scene so I've set up this oh so simple totally unscientific poll to give me an idea of just what you guys use in your DJ and music making experiences. Check either the poll above or the right hand column and cast your vote accordingly. So the public have spoken (some a little too harshly to be frank) and the winner of the BPM Battle 2008 has been picked. And that winner is DJ Sinical. 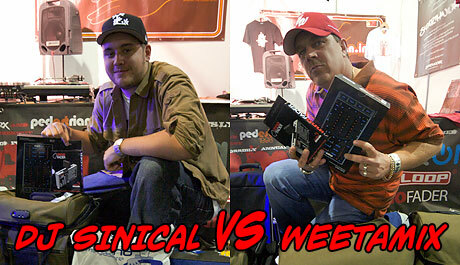 Commiserations go to Weetamix - a valiant effort but the voting public had Sinical as the winner by some margin. Sinical wins himself a pair of Stanton STR8-150s, an uberstand, carts and a heap of other Stanton related stuff. Huge thanks to Stanton for getting behind the battle in such a big way. I hate deck covers. Big ugly plastic lids designed to collect dust, tea rings and generally piss me off no end. But ironically, that is their purpose - to protect your expensive investment in DJ gear from the not so hostile bedroom environment. But what about the rather more warzone like actual real club environment? That's where Decksavers some in. They make fetching clear covers to keep Pioneer CDJ-1000 MKII and IIIs safe and sound, but now they've also got one for mixers, namely the Pio DJM 600/700/800 as well as xone: 62 and 92. And we've got a full set to give away. Every year, DJ Mag does a gear awards thing - the Tech Awards. Normally, it's been a public vote and behind closed doors private DJ VIP judging affair, but this year DJ Mag shook things up a little. The public got to vote for their favourite things, but the top voted products got pushed through to the oh so public Tech Awards show at BPM. 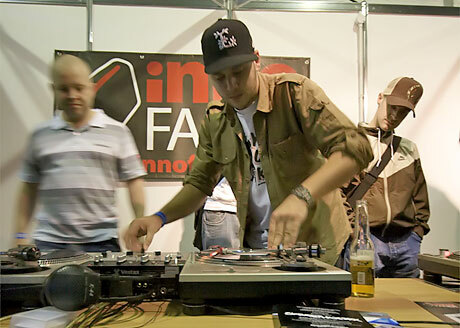 This basically consisted of a DJ manufacturer equivalent of the Dragons Den, where the various manufacturers' best demo people were put under the spotlight and made to show off their stuff to the gathered DJ VIPs (as well as an ever changing public crowd). And out of this came a few surprises, as well as some very excitable manufacturers who scooped awards right from under the noses of their competitors. 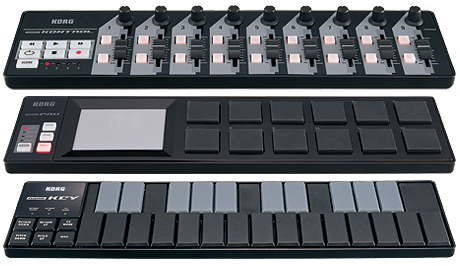 Stating the bleeding obvious once again, MIDI controllers are the rage with the hep cats these days. And they seem to be getting smaller with each new release as well. The Korg nano range is just hitting the market as we speak, but clearly Korg have seen that white isn't necessarily the new black, and thus have introduced some suitably coloured and more conservative models for the more traditional DJs out there. BPM Battle 2008 - CLOSED! When the idea of running a battle on the AI/Pedestrian stand at BPM 2008 popped into my head, I had no idea just what a time sucking logistical pain in the arse it would be. Thankfully however, it was very much worth the effort and a good time appeared to be had by all who attended and took part. But the battle is over and the daily winners have departed with their generous piles of booty. And now it's your turn to decide who takes away the bumper prize package from Stanton - day 1 winner DJ Sinical or day 2's top dog Weetamix. UPDATE: The voting is over - Sinical won!